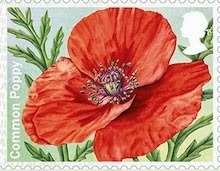 More Post and Go Stamp news, Flags, Poppies, and Animals. In the absence of anything new happening on the Machin definitive front, I can bring you some more news on the Faststamp or Post and Go scene. ... the MA13 Union Flag stamps hadn't appeared in NCR machines before, so there was a whole load of new material to obtain. And these are real Post and Go items dispensed for the public to use on letters and parcels, not the purely philatelic items dispensed by the Royal Mail machines! I can let you have images of various Open Value stamps - the most widely dispensed stamps from Post Office NCR machines - if you want to see them. These will be the items for postal history collections in the future - and very few people seem to be bothering with them! Machins on cover from all sources. I do have a small collection of Post and Go stamps, some from SSKs, but very few Open Value, and the ones that I do have, from any source are nearly all from other collectors or from dealers. I would certainly agree that to find and accumulate a comprehensive collection of 'used-on-cover' Open Values would be very worthwhile, and would definitely be a challenge. So start looking for Open Value stamps on letters, cards and packet wrappers: I'll be happy to have scans of these to demonstrate that they do exist and have been collected - but please don't send them until November. Remember, postal history is best if it is dated, and most Post and Go/NCR stamps going through the post is not postmarked. In the Special delivery case pictured nearby, the sender is another dealer, so obtained the counter datestamp on it. Which brings me to other news from Royal Mail's News page. The Poppy design from the Symbolic Flowers Post and Go set will be re-introduced from 24 October until 13 November 2016. The stamps will be available from Post and Go post offices, The Postal Museum, Royal Navy and Royal Mail Enquiry office machines. PAIGNTON SSK: This office has Union Flags put in on the 15th August,they have NO Year code. YEOVIL Office: also NO Year Code.